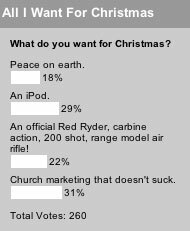 The results are in for our fun little “what do you want for Christmas” poll, and thankfully church marketing that doesn’t sucked squeaked past an iPod for the number one spot. Apparently it’s just not the year for peace on earth. This week’s poll asks what kind of special marketing your church did for Christmas. We’re going crazy this week and letting you pick multiple answers. It’s better to give than to receive. As Christians, let’s focus on how we can help the unfortunate in 2006, with the love of Christ.